Steven Spielberg's epic about a youngster's harrowing and remarkable experiences in World War II-era China after the Japanese invasion. Awards: Nominated for Best Cinematography; Best Art Direction-Set Decoration; Best Costume Design; Best Sound; Best Film Editing; Best Score-John Williams. DVD: Widescreen 1.85:1/16x9; audio English Dolby Digital 5.1 & Dolby Surround 2.0; French Dolby Surround 2.0; subtitles English, French, Spanish, Portuguese, Korean, Thai, and Chinese; closed-captioned; double-sided DVD 14; 45 chapters; rated PG; 152 min. ; $24.98; street date 11/6/01. Supplements: “The China Odyssey: Empire of the Sun, a Film By Steven Spielberg” Documentary; Theatrical Trailer; Awards, Cast and Filmmakers. 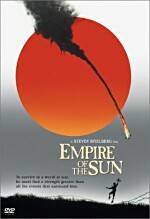 If there can be such a thing as “forgotten Spielberg”, 1987’s Empire of the Sun fits that category. Along with 1989’s Always, Empire stands as possibly the director’s least well-known film, though I have a feeling 1997’s Amistad will become equally obscure over time. Due to his stature, they’ll never be totally neglected, but they are definitely some of his more obscure efforts. Those first two flicks found Spielberg during his “serious” period. After he became incredibly successful as a director of action and fantasy movies with pieces like 1975’s Jaws, 1977’s Close Encounters of the Third Kind, 1981’s Raiders of the Lost Ark, and 1982’s E.T. The Extra-Terrestrial. While still a hit, 1984’s Raiders prequel, Indiana Jones and the Temple of Doom, marked the first blemish on Spielberg’s record since the disaster that was 1979’s 1941. Temple did fairly well financially, but it didn’t approach the heights of its predecessor, and it also stirred controversy due to its semi-graphic content; along with films like the Spielberg-produced Gremlins, enough 1984 offerings pushed the “PG” envelope to lead the MPAA to create a new rating, “PG-13”. After Temple, Spielberg took his first step down a more dramatic path with his 1985 adaptation of The Color Purple. Considering the content of the film, it did quite well at the box office, and it grabbed a solid 11 Academy Award nominations, including Spielberg’s fourth nod for Best Picture. Alas, Oscar night would be especially unkind to Steve that year. Purple took home not a single prize that evening, an achievement that tied a record for futility; only 1977’s The Turning Point earned that many nominations but left empty-handed. This seemed to be a slap in the face for Spielberg, who didn’t even get a nod for Best Director. From there Spielberg entered his least successful period, at least commercially. The Dark Years lasted from 1987 to 1991. With a gross of only $22 million, Empire made less money than any Spielberg flick since 1974’s The Sugarland Express, his first theatrical offering. Sure, at 152 minutes it was a long movie, but Purple was equally lengthy yet it still took in more than $90 million. Always provided another disappointment, but its $43 million nearly doubled the take of Empire. Granted, it was a much more commercial project, and it included actually stars, as opposed to then anonymous actors like John Malkovich, Christian Bale, and Ben Stiller. Within the Dark Period, Spielberg did have one major hit: 1989’s Indiana Jones and the Last Crusade. However, its popularity seemed like a given. The film deserves some credit, for it made more money than had Temple despite the five-year layoff, but it still feels more like a triumph of the familiar. Spielberg’s bland era continued with 1991’s Hook. Technically, the movie was a hit, as it took home $120 million. However, given the film’s high profile and star-studded cast, $120 million was chicken feed. Add to that the fact the flick was a joyless affair, and it strongly represented this portion of Spielberg’s career. Happily, this period formally ended in 1993, which was the most successful experienced by Spielberg. Not only did Jurassic Park rake in an amazing $356 million, but Schindler’s List finally broke his negative string at the Oscars. It won Best Picture, and Spielberg got his first Best Director award. (He’d also earn one for 1998’s Saving Private Ryan, though the movie lost to Shakespeare In Love for Best Picture.) Oh, and it also added to Spielberg’s unprecedented list of AFI 100 films; it’s his fifth movie on the list, which is more than any other director. Things haven’t been totally peachy in Spielberg’s career since 1993. 1997’s Jurassic Park sequel, The Lost World, did well but didn’t come close to the success of its predecessor, and it took a drubbing from many dissatisfied fans. Amistad was both a commercial and critical disappointment. It made only $44 million, and it earned but four Oscar nods, all in fairly minor categories; it would take home no awards. He rebounded quickly with the very popular and largely lauded Ryan, but after a three-year hiatus, his return to the screen in 2001 with A.I. was another disappointment. It was generally seen as a box office dud, though I think $78 million for that kind of flick wasn’t bad. Nonetheless, it stirred little positive attention across the board and didn’t live up to expectations. Some of Spielberg’s “lesser” titles deserve their obscurity. Always is a cute but insubstantial flick, while Amistad is excessively “politically correct” and pushy. Empire of the Sun, on the other hand, is a more complex picture. It never reaches the heights of Spielberg’s best flicks, and I don’t believe Spielberg will ever create a drama that bests his fantasy fare. Just as Woody Allen has created some good dramas that don’t equal his comedies, Spielberg’s true gift is for escapist fare; his other works may be solid, but they don’t seem transcendent. However, Empire falls among the top range of his serious works. While not a totally successful piece, the movie provides a surprisingly rich and unsentimental look at a portion of World War II little known to most Americans. It’s not as broad and crowd-pleasing as Ryan, and it packs much less of a punch, but it still provides a compelling and distinctive affair. Set in China during the 1940s, the movie follows young Jamie Graham (Christian Bale) throughout the first half of the decade. At the film’s start, we see him as a boy who lives an exceedingly privileged life. His father’s a successful businessman with many connections in the British section of China, and Jamie has a cushy little lifestyle going for himself. All of that ends after December 7, 1941. Following the official start of World War II, the Japanese invade these areas of China, and Jamie becomes separated from his parents. Eventually he starts to starve and as he scrounges around the streets, he meets Frank (Joe Pantoliano), who rescues him from a nasty kid. From there Jamie meets mercenary extraordinaire Basie (John Malkovich). After a rocky start, Basie renames Jamie as Jim and lets the kid tag along with the pair. Eventually they end up in a camp operated by the Japanese, and there they spend most of the film, as Jim copes with this spare and dismal life while the war rages outside of these parameters. Empire largely dispenses with much of a plot, as it becomes more of an experiential piece. Interesting, Spielberg sticks almost exclusively with Jim’s point of view throughout the movie, a move that apparently confused some viewers; from what I’ve seen, many took some of the flick’s events - like a fighter pilot who waves to Jim as he flies past - literally. Clearly these weren’t intended to be interpreted in such a manner, and it’s that fact that lends the movie an unusual tone. As I watched Empire, I often thought that it seemed as though the flick treated the Japanese with too much respect. They treated many of their prisoners and opponents in a brutal manner, and while the film gave us a hint of that, it seemed to portray them in an oddly positive light much of the time. However, when one understands the point of view portrayed, it made more sense. Despite the atrocities doled out by the Japanese, Jim still saw them in a romantic vein, largely due to his fascination with their soldiers. Despite the potential for a romanticized tone, I thought Spielberg kept Empire remarkably free of sentiment. His work is often criticized for its allegedly schmaltzy attitudes; I don’t agree with most of those assessments, but the reputation developed nonetheless. In any case, I found Empire to largely lack those attitudes, as it came across with reasonable bluntness within its constraints. Since it used Jim’s point of view, the film was able to get away with a less-than-realistic tone, but it managed to avoid the pitfalls of a sappy attitude that might have occurred. Much of the thanks for that resulted from Bale’s simply outstanding performance as Jim. Only 13 at the time of Empire’s filming, Bale, provided an astonishing piece of work as he had to take Jim through a myriad of situations and attitudes. He starts as a bratty, spoiled boy and progresses into a survivor who goes through various stages of confidence and capabilities. Bale handled all of these with remarkable aplomb and created a diverse, believable and gripping portrait of the boy. Not only did he manage to hold his own, but also Bale carried the movie and took it to a higher level. Bale appeared in almost every shot of Empire, and he held up his end of the bargain well. Why Oscar overlooked him seems bizarre to me, but in those anti-Spielberg years, it doesn’t surprise me. My complaints about Empire were few. For one, Jim didn’t seem to age much during the film. I think he was supposed to be 15 by the end, but he sure didn’t look it. However, I suppose his malnutrition during the camp internment would result in stunted growth, so his lack of development wasn’t totally off-course. I also felt the ending included far too many big coincidences. These didn’t harm the film for me, but they pushed credulity to a large degree; even if we consider the stretches allowable due to Jim’s point of view, some of these elements seemed like a little too much. I initially saw Empire of the Sun on video in the late Eighties, and I didn’t much care for it. Why that was, I don’t know, for my recent screening of it showed that the film offered a rich and compelling experience. Boasting self-assured and unsentimental direction from Steven Spielberg and an absolutely top-notch lead performance by Christian Bale, Empire stands as one of Spielberg’s best non-fantasy flicks and it deserves a much wider audience than it has received. Empire of the Sun appears in an aspect ratio of approximately 1.85:1 on this double-sided DVD-14; the image has been enhanced for 16X9 televisions. Though a few minor problems cropped up along the way, overall I thought the movie looked quite solid. Sharpness usually appeared strong. A couple of minor instances of softness occurred, but these were very rare and modest. The film almost always looked nicely crisp and detailed. No problems with jagged edges or moiré effects occurred, but a smidgen of edge enhancement occasionally marred the presentation. Print flaws seemed almost non-existent. A little grain popped up on occasion, and I saw a speck or two of grit, but that was it. Otherwise the image looked very clean and fresh. Colors seemed appropriately subdued for the most part, and they came across as accurate and distinct. I felt the hues looked well defined and strong, as they demonstrated clean tones with no signs of bleeding, noise, or other concerns. Black levels also appeared dark and rich, while shadow detailed consistently seemed acceptably opaque but never excessively dark; all low-light sequences showed good visibility. Overall, Empire of the Sun offered a very positive picture that lost out on an “A”-level grade solely due to the minor edge enhancement. The film’s Dolby Digital 5.1 soundtrack also seemed solid. The soundfield appeared nicely broad and engaging. Most of the audio stayed with a forward emphasis, as the front channels showed good spread and activity. Music demonstrated clean delineation and good stereo separation, while effects seemed broad and well developed. Those elements moved nicely across the speakers, and they created a lively and vibrant presence. At times the mix sounded a little artificial; for example, a scene inside a clamoring crowd felt forced and staged. However, most of the film showed a reasonably natural feel. Surround usage appeared fairly positive. Most of the movie featured audio that stuck with general reinforcement of the music and effects, though these provided a satisfying dimension. During action sequences, however, the rear channels came to life nicely. Various vehicles traveled neatly from front to rear - or vice versa - and the fighter planes offered fine split-surround elements as well. As a whole, the soundfield delivered a good experience for a movie of this vintage. Audio quality also seemed very good for the most part. Dialogue consistently sounded distinct and natural, as I discerned no concerns related to edginess or intelligibility. Effects showed their age at times, as they could sound somewhat thin and flat, but they usually appeared rather clear and accurate, and they lacked any signs of distortion. Explosions and other loud noises demonstrated somewhat boomy but fairly substantial oomph. Music came across as consistently bright and clear, but I felt much of the score lacked much depth. Some of the percussive elements to the music sounded nicely rich and vivid, but most of the time I thought the score seemed a bit thin; it lacked the presence and dynamics I expected. Overall, I still felt the soundtrack worked well for an aging movie, but it wasn’t a great piece. Empire of the Sun includes a sparse roster of extras, with only one major piece. We find the film’s theatrical trailer, a listing of awards won by the movie, and a page of Cast and Filmmakers; the latter simply provides names without any biographical information. However, the length and depth of the documentary helps make up for the absence of additional supplements. Entitled The China Odyssey: Empire of the Sun, a Film By Steven Spielberg, this 1987 piece lasts for 49 minutes and five seconds as it provides a very interesting look at the movie. A few interview bits appear with Spielberg, actor Christian Bale, and an unnamed model plane operator. However, the majority of these segments feature J.G. Ballard, the author of the fairly autobiographical book on which the flick was based. I really enjoyed these, as they helped us learn the facts behind the tale, and Ballard provided a personal perspective that was compelling. Hosted by Martin Sheen, we also got a short but helpful discussion of the history behind the film. We learned about the facts of the Japanese invasion and the set-up of China at the time, and this neatly put the events in perspective. While these elements were very good, the strongest aspects of “The China Odyssey” came from its many shots from the set. Most of the program consisted of these pieces, and they offered a fine look at the processes used. I wouldn’t call this a documentary that really gave us the down and dirty ins and outs of the production, but it was still fascinating to watch Spielberg work with the actors, especially via his interactions with Bale. “The China Odyssey” wasn’t a great program in the vein of “The Beginning” on The Phantom Menace, partially because it felt a little like a promotional piece at times, but it offered a solid show nonetheless. As did the film that it touted. Empire of the Sun may well be Steven Spielberg’s least known flick, but it doesn’t deserve its obscurity. Arguably the best of his “serious” works, Empire provides a consistently engrossing piece that also shines due to a stellar performance by Christian Bale. The DVD offers very positive picture and sound plus a good documentary. Even if you don’t normally care for Spielberg’s material, Empire of the Sun merits a look.